Mooching or motor-mooching is a technique that is used frequently by our neighbors on Prince of Whales Island and by a few of us “local Ketchikan boys” as well. 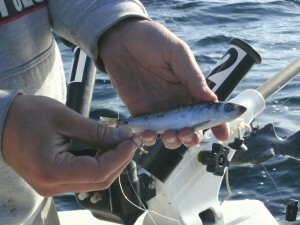 This technique involves using only a small banana weight (usually 2-5 ounces) and a long double-hook leader with a herring cut-plug on it. The fishermen slowly lets out the weight and the cut-plug until it is at the optimum depth, and if a fish is not caught, slowly reels it back in while watching and waiting for a gentle strike. This kind of fishing requires a lot of patience because often the fish will come up and “mouth” the bait, not actually swallowing it. If the fishermen tries to prematurely set the hook, he will simply rip the cut-plug out of the Salmons mouth and the fish will escape. The proper technique is too give the fish a little bit of line when you feel him initially bite or mouth your bait and wait until you feel the rod “load-up” with pressure, before you set the hook and fight the fish. This technique is unbeatable when you are in a group of feeding Salmon and often you will get another bite almost as quickly as you can rebait and get your hooks back in the water. The downside of this technique is if you are unsure about where the fish are or if there simply are not very many around, then this would not be the best option. #1. It is peaceful and quiet! If you have the engine running at all, then it is usually at a low RPM and you can easily hear what is going on around you. #2. When you are on a school of salmon, it is easy to stay on them and catch numerous salmon in that one spot. #3. You get to hold the rod the whole time! Unlike trolling, the rod is constantly in your hand and it is totally up to you to catch the fish. #4. It is really fun! Its easy to learn and anyone can do it with a little practice! #1. You get to hold the rod the whole time! If you cant figure it out then you wont catch anything! Its totally up to you to catch the fish (with guidance of course). #2. It is really hard to fish this way when you dont know where the fish are or the number of fish is low. #3. It is really hard to be patient when you feel the initial “bump” of a salmon mouthing your bait. If you can’t learn patience then you wont catch any salmon! Are you ready to come salmon fishing in Ketchikan Alaska? Contact us now for booking information!